Justin: Cherry Blossoms. They’re white, stand out white, adding a hue of serenity to the rolling hills. We took the KTX train to Gyeongju which is about 20 minutes from Eonyang to check out the Gyeongju Cherry Blossom Festival. We met up with another Justin from our church in Ulsan. Justin and I share a few parallels aside from being blessed with such a just and mighty name. We pursued theological and musical studies, and left to our own devices we enjoy leisurely time at home, truth be told a little too much chillaxing is on the menu. So fortunately we have my indefatigable wife to engineer this outdoor adventure, the intrepid and highly organised Mrs Kat who arranged and controlled proceedings leading the two Justins. Kat: Yes not only did I have Justin wanting to do nothing but now two of them! And both called Justin! (I think of them as Thompson and Thomson from Tintin). You see I like to do something called travelling when I visit a country. I don’t go somewhere and do nothing. I mean I could sit at home in Sydney and do nothing. What would be the point of travelling if you do nothing? I got places to see, photos to take. And you think I’m bad? Try travelling with my parents. Justin: First stop were the five tombs. I envisaged something a little more ornamental and intriguing, something like the Egyptian mummies or other unique cultural way of laying and burying the dead. Instead I get five large mounds of green grass hill. How un-tourist friendly this dead burying culture seems to be! I mean come on guys I think these dead emperors deserved a little more than golf course modification as a memorial. Fortunately in the same park there was bamboo, and lots of it. Bamboo makes the world a better place. Kat: Thankyou my culturally distasteful husband. 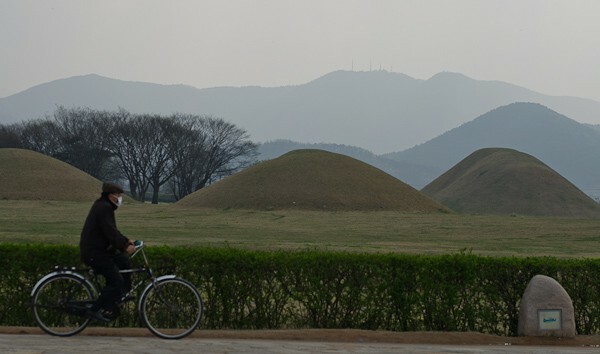 Yes they were mounds, but Gyeongju is also a UNESCO world heritage site for that very reason. Burying people under great mounds of dirt is actually a unique way of memorialising someone, similar to the burial mounds in England and Ireland. Look ma, I’m at the tomb! A man cycles past the tombs. Okay, so they’re not the pyramids. We were wandering down the river, Justin and Justin discussing the need for food (of course), when I saw a sign saying Korean Restaurant. When boys start to grumble about their stomachs you need to find the first food you can get, otherwise it will be an endless cycle of “I’m hungry, when can we eat?” All of you with children will probably associate with this. So, follow the signs. Under a stone arch we were met by a woman with a walkie-talkie who radioed ahead to see if there was a table available. The restaurant spread out through ancient buildings, shoes at the doors as people sat on the floor. 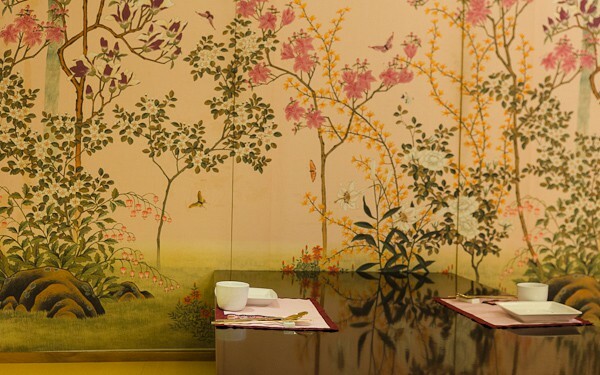 She ushered us into the main room, with a stunning wallpaper of butterflies and branches, the other wall covered with a framed hanbok. I want this wallpaper. Gimmie! NOW! The waitress, dressed in Korean traditional dress, unravelled a scroll. This was the menu. She motioned to the first option: 30,000 for each person. $30. Okay, not what we’d normally pay for lunch but this place did have walkie-talkies. Each of us tried to scope out the other tables, but before long plates of steamed fish dumplings, beef stew and squid omelet arrived at our table. Delicious. Justin: Definitely the best meal since coming to Korea, the adage you get what you pay for is not bound by cultural limitation. We were treated to a banquet, with plenty of Korean yummies. Kat: Before I forget, we finished the meal with a slice of Kiwi fruit and ice-cold cinnamon tea. Heavenly. Justin: Later in the afternoon, we indulged in some fairy floss or as Americans like to call it “cotton candy”, much to the other Justin’s amusement. Kat: As well as soft serve and Gyonju-ban (Gyongju special bread), which are South Korean pikelets with bean paste instead of jam and cream. So we pretty much ate all day. Justin: Kat’s photographic nous, ability and exceptional camera lenses came to the fore again as she took some majestic close-ups of cherry blossoms that take us into a soft white heavenly pillow universe of organic growth and delight. 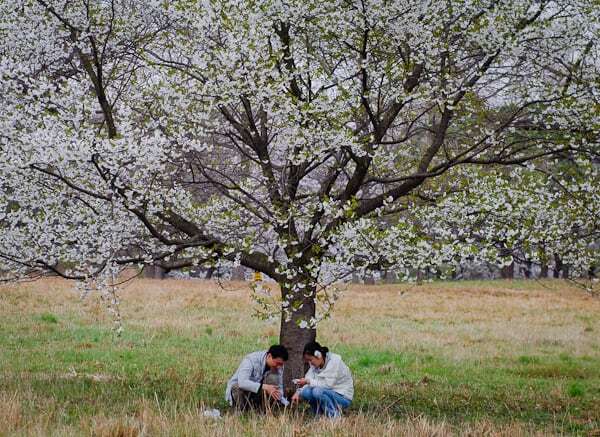 One of her photos of these Cherry Blossoms catapulted her into the top 400 on Flickr, an amazing achievement considering the volume of photos uploaded to that site daily. So cute, cycling around the cherry blossoms. A blossoming romance? I know, lame dad joke. Kat: Yes, like many Koreans and Japanese before me, I spent ages looking at the cherry blossoms through a lens. Couples came out with their tripods, ready for the studio cherry blossom shot. Or the girls posing among the flowers pulling them around their faces and smiling. 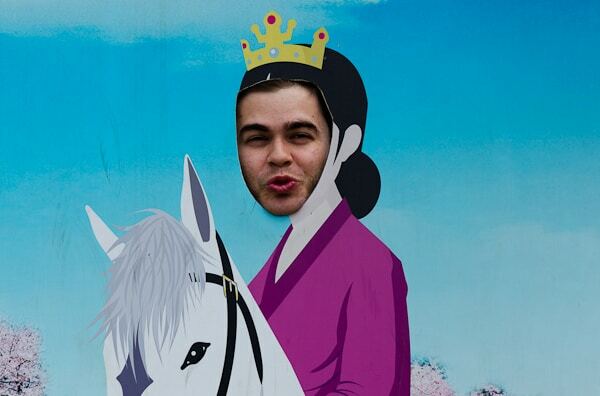 To the great amusement of a couple of high school girls, Justin and Justin stood in the princess cutout. A very hairy princess. Justin: Getting home was an interesting ordeal, we didn’t want to wait four hours for another KTX train so we cabbed it back to Eonyang. A long taxi ride that took us in circles, but everything is still so new and fresh here. Sometimes circuitous tracks are welcomed when you are getting to know a new place and new people. The monkeys have definitely landed. Kat: Indeed we have. In other news, we discovered several things yesterday that are going to make our life more comfortable this year. Justin bought a guitar and has not stopped strumming. And I found my heaven of heavens in E-Mart, Earl Grey tea. Tea + Books = Paradise. Oh yes, and that other guilty pleasure, Game of Thrones. YEAAAHHHH! Earl Grey and Game of Thrones! Haha! This was a fun read! It was also a great adventure. Kat, I agree with Justin about the mounds for tombs – very unimpressive. In fact, it would be much more cool if they actually made those mounds into golf courses. I don’t like tombs or golf courses, but that combination would be rather interesting. However, on a different note, I have to tell you that I am captivated with almost every single picture you take. Ask anyone and they know that I’m not a picture person. I usually find looking at pictures to be very boring. But I find myself saying, “Wow!” to almost every picture I see. So, keep up the good work. Just a quick comment to say that you have some amazing photos! 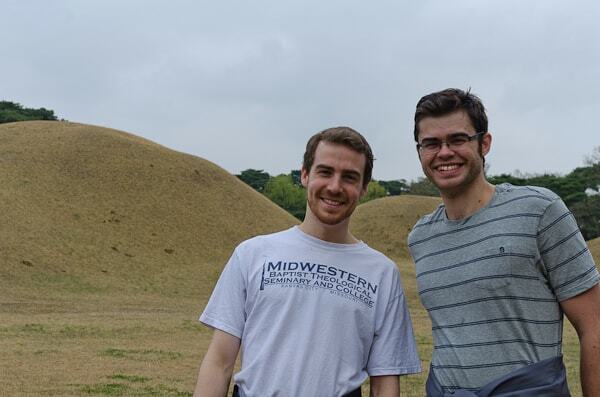 I lived in Gyeongju for a while and sadly I didn’t have my awesome camera yet, so this post has made me jealous. And made me want to visit again! Thanks Chris! Glad to hear from another ESL teacher in Korea. We’ve only just moved here so we’ll be posting a lot more as time goes on. Sooo….I know that this was a while ago…but I just read it now. LOVED IT! Gyeong-ju is such a nice place to visit! It’s definitely a relaxing day trip from Busan. I just blogged about my visit there too!